Among those suits, the organ grinder was the most peculiar construction. 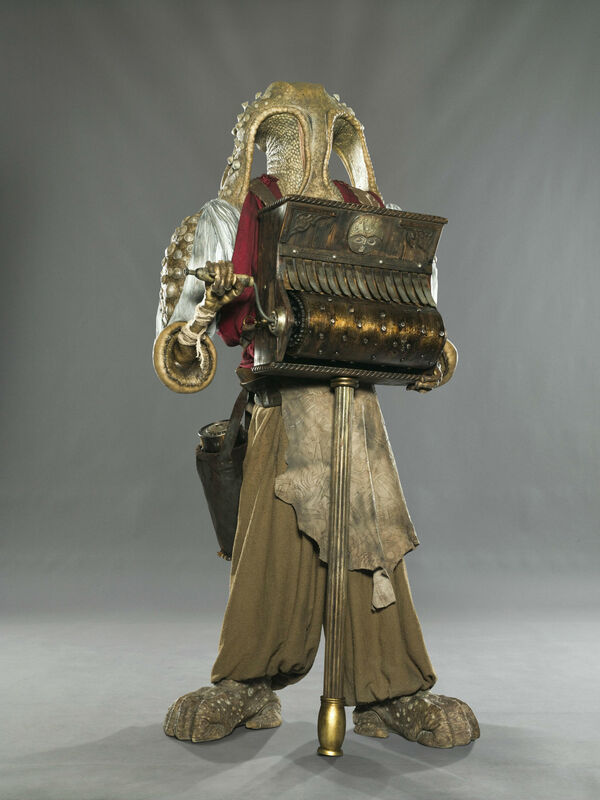 “The Organ Grinder is actually a small guy but built up to human size,” Wallace explained, “because the design demanded that he had a very thin neck that you really couldn’t do on a human. He also had very wide shoulders, so you’ve got a thin guy that’s built up to human size, with mechanical arms that are driven by this organ that he carries around.” Completing the look of the character was a small digital bogart. 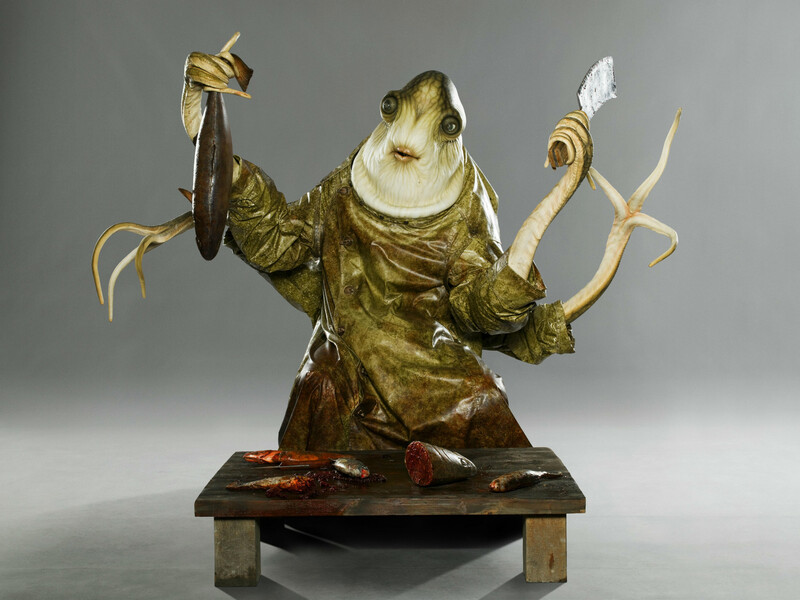 Creature designer Nigel Booth and his crew contributed to the creation of Silkard, the fish vendor — an aptly-named frog-like tentacled creature that sells fish. The monster was created as a suit worn by Brian Herring, with a radio- and cable-controlled head — able to perform lip synchronization, eye rotation and eye bulging — as well as cable-controlled tentacles. All the mechanical features were devised by Ady Parish and Jared Manly. The creature’s skin was cast in semi-translucent silicone. The tadpole vendor was another Solution Studios creation. 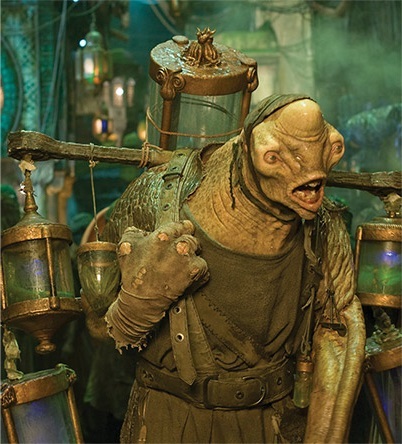 “There’s a very large walkabout suit called the tadpole vendor,” said Leo Burton, part of the Solution Studios crew, “and that utilized a six foot seven actor inside to carry this enormous suit. 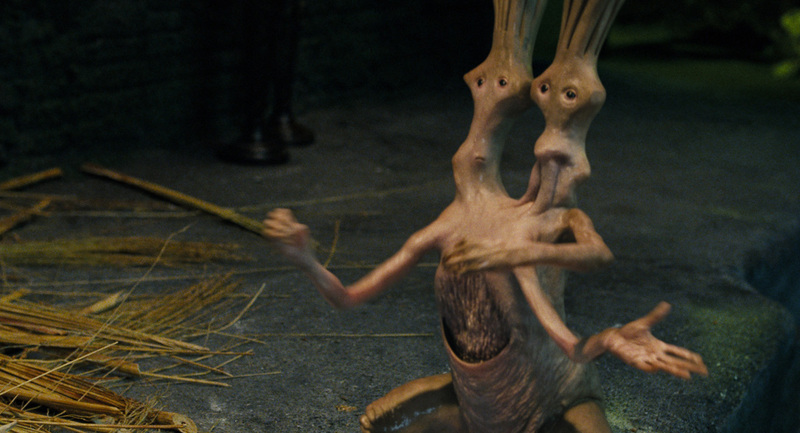 The character carries these jugs of water on his back which are very heavy, so this poor guy was wandering around the set, but that was a animatronic suit, so we loved working on that.” Silicone ‘tadpoles’ were sculpted by Colin Shulver and put inside the tanks. 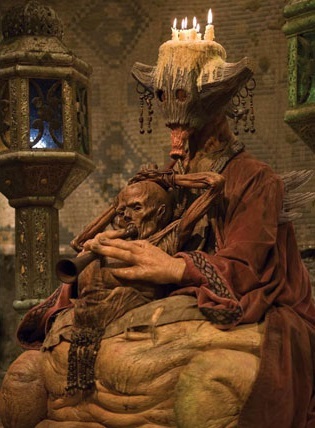 The Solution Studios roster also included the bagpipe player, “a sitting creature, which is an animatronic suit with a human ‘bagpipe’ being played by a weird creature,” according to Nigel Booth. A maquette by Matt Rose and Chad Waters that was originally intended to be the Fragglewump ended up becoming the Cronie (coincidentally, both characters ended up being punched away by Hellboy). 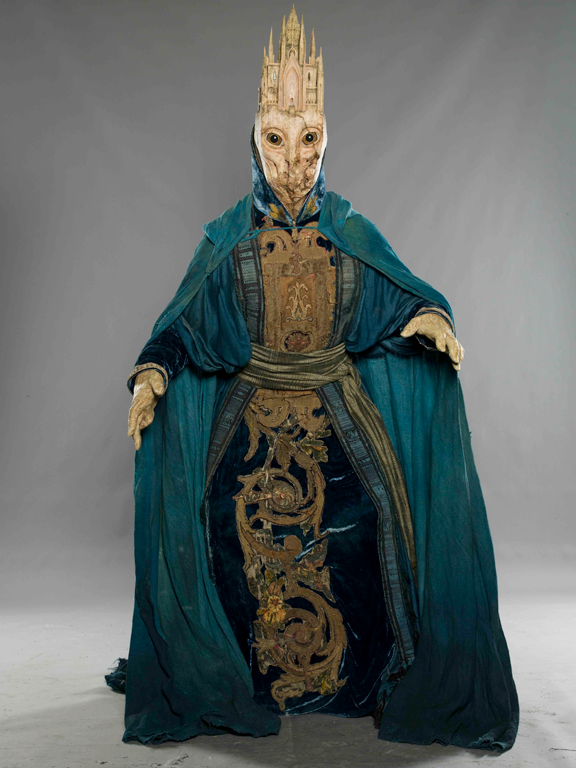 This creature was built by Spectral Motion as a full-size suit worn by Brian Steele, with a fully-mechanized animatronic head. The suit also featured arm extensions. When Hellboy punches the Cronie away, the character becomes a Double Negative digital effect. 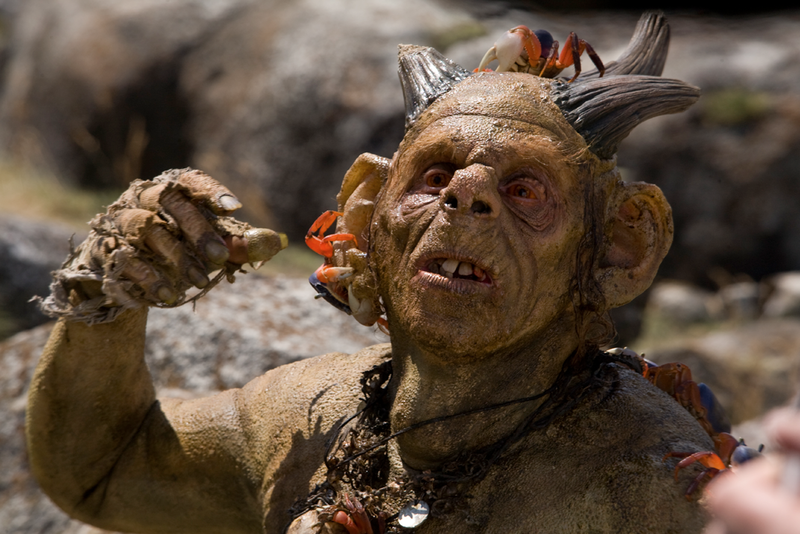 The same model was used for several other trolls seen walking around the market. 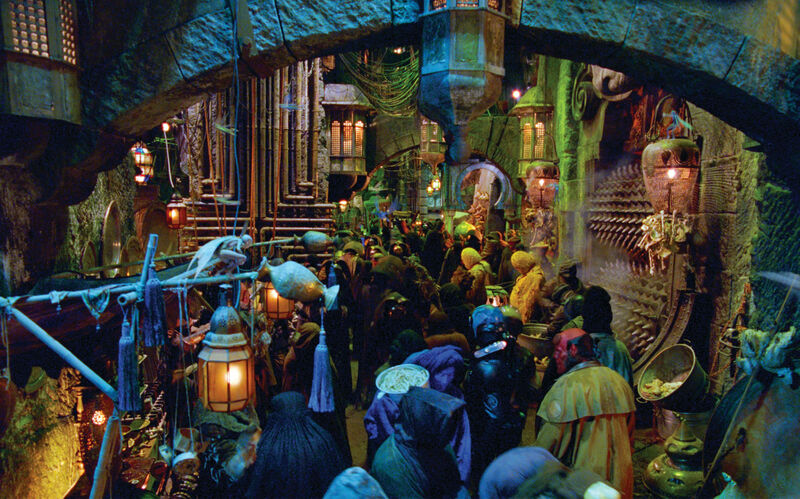 Entering a map shop, Princess Nuala is greeted by Cathedralhead, an unusual-looking humanoid whose name is all the too descriptive. 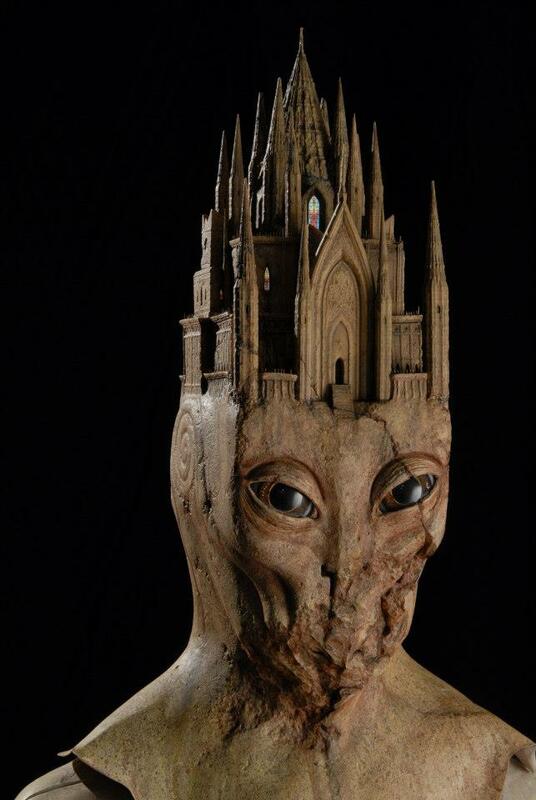 Born as a sketch in Del Toro’s notebook, the design was refined by Chet Zar into a maquette, The artist related: “it was based on a Guillermo design; he had given me a sketch that was really cool, which was the basic idea with the two big eyes and not really any mouth and a big cathedral on the head, and then Mike Mignola added some cool design changes, — so there was a big chunk missing from its chin like it was old and made of stone, so that really added a lot. I had some input on the paint scheme and I sculpted it and tweaked the design a little bit, so it was a collaborative thing, but it was definitely based on a Guillermo design. 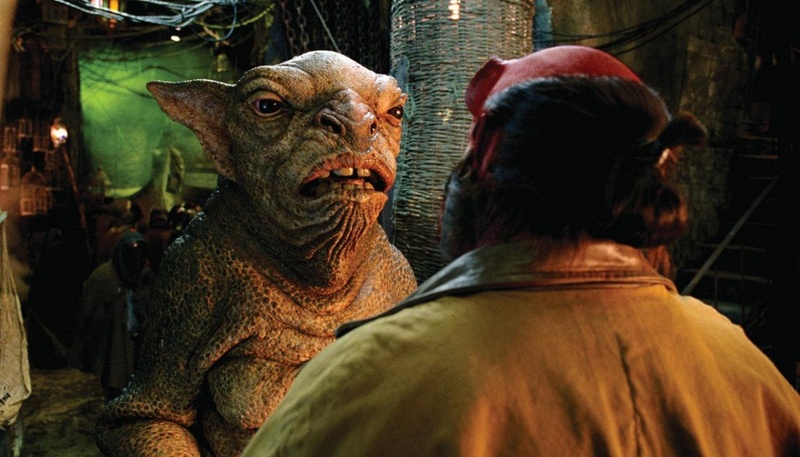 I headed up that crew as well, building the character.” The Zar maquette was the base for the Spectral Motion make-up and suit applied on Doug Jones, which featured a head extension complete with radio-controlled animatronic eyes. 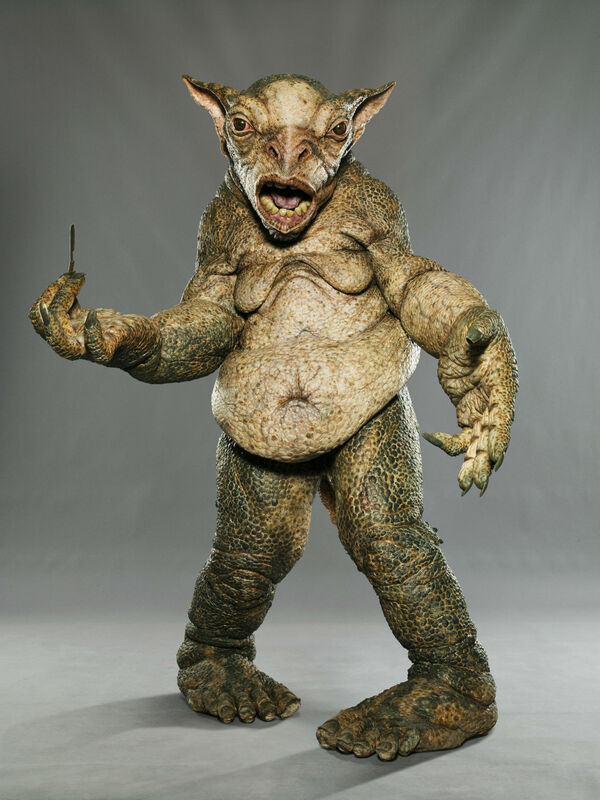 While the creature roster was left untouched for the most part, some characters that were supposed to appear in the Troll Market were left on the cutting room floor. 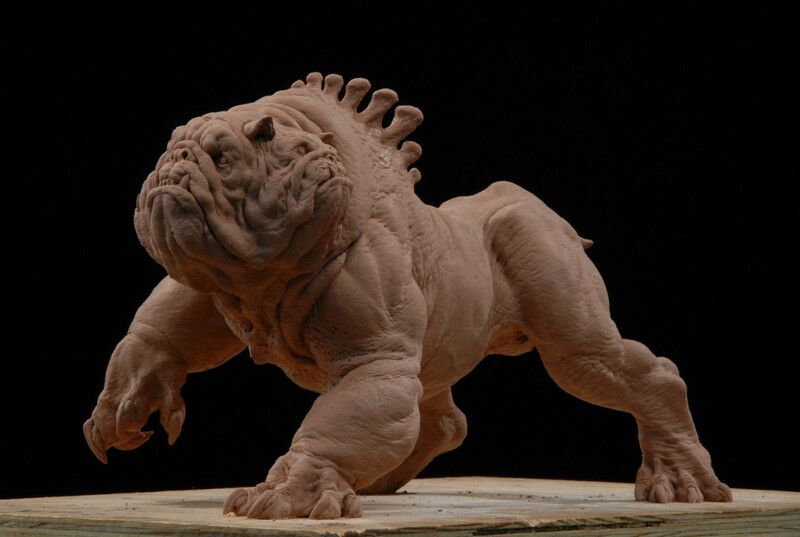 Such is the case of the Yrdrig, a three-headed dog-like monster that was on its way to completion — with a maquette sculpted by David Grasso — before the scene that would have featured it got cut for budget reasons. 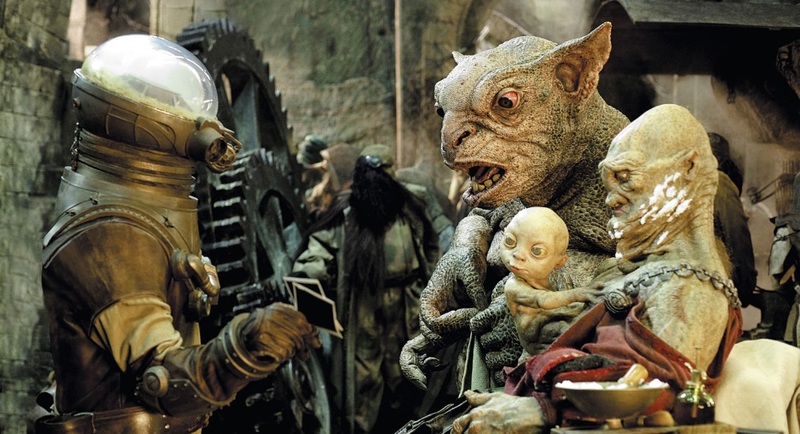 “We had one very disappointing change, which was the character of Yrdrig,” Elizalde related, “a three-headed bulldog monster — we didn’t get to finish him, although we weren’t really building the puppet itself, we were just building a scan maquette for the digital work, and that’s one of the big sequences that got cut out.” Another character, dubbed ‘the wizard’ — which would have been played by Doug Jones — was cut for similar reasons. 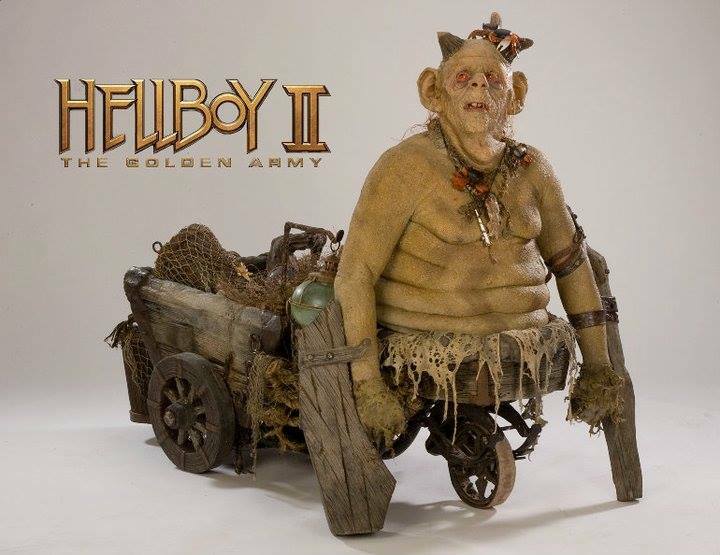 For more pictures of the Hellboy II creatures, visit the Monster Gallery. 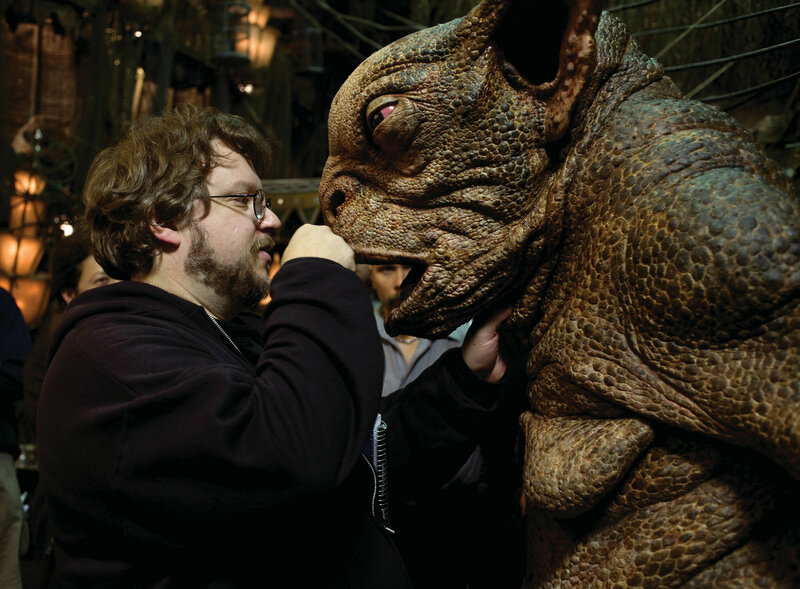 Posted on 29/06/2018, in Movie Monsters and tagged Cronie, Guillermo del Toro, Hellboy, Hellboy II, Spectral Motion, Wayne Barlowe. Bookmark the permalink. Leave a comment.